It's National Cupcake Week! - there's a week for everything isn't there. Personally I don't need an official week, any excuse to get the piping bag out. 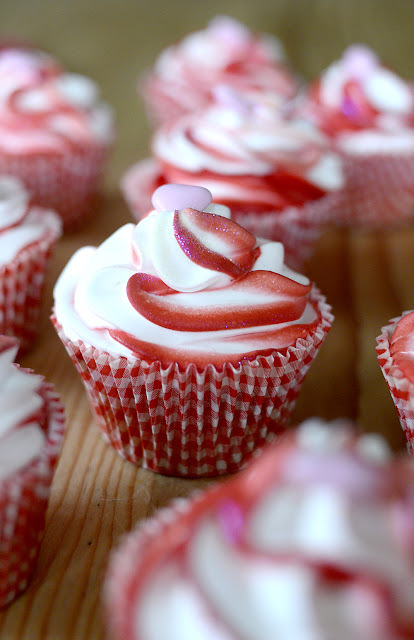 These are Raspberry Cupcakes. Pink vanilla sponge, scoop out a little hole once cooked and fill with a teaspoon of raspberry jam then top with italian meringue. Yum. Stunning, if a little reminiscent of signal toothpaste! I'll bet they don't taste like that though. Lol Janice, they do a bit don't they, didn't stop anyone scoffing them though. Yum! and I love your cupcake cases. I recently used the same ones in a blog post too - so pretty!